“Whilst current smart city innovations are almost exclusively focused on harnessing big data and new technologies to improve city services – such as running the tube more efficiently – RIBA asks how the same data and tools could be used in architectural and urban design today, and what this could mean for the future of cities. In November 2013 we launched a joint report with Arup ‘ Designing with Data: Shaping our Future Cities ’ in which we show how big data and the volume and speed with which it is now becoming available affords new possibilities to understand people and places more deeply to inform design, and how it is delivered. By bringing big data together with planning and design processes, we argue we have the power to transform cities into places that are more responsive to the public’s needs and aspirations while also strengthening social capital and engendering digital inclusion. The report provides a starting point to smart architecture and planning, but Government action is required to take place-making into the digital age, and to extend the economic, social and environmental benefits of big data to the spatial disciplines of planning and design. One of these actions is facilitating the digitisation of the planning process. We believe that as part of its Open Data initiative, the Government should scope how it can standardise the digitisation of all information submitted for planning, and of standardising design data collection across local authorities. This public data should be open to unleash economic growth; and local authorities should be encouraged to use open data to inform local planning strategies. What would a digitised planning system look like and do? 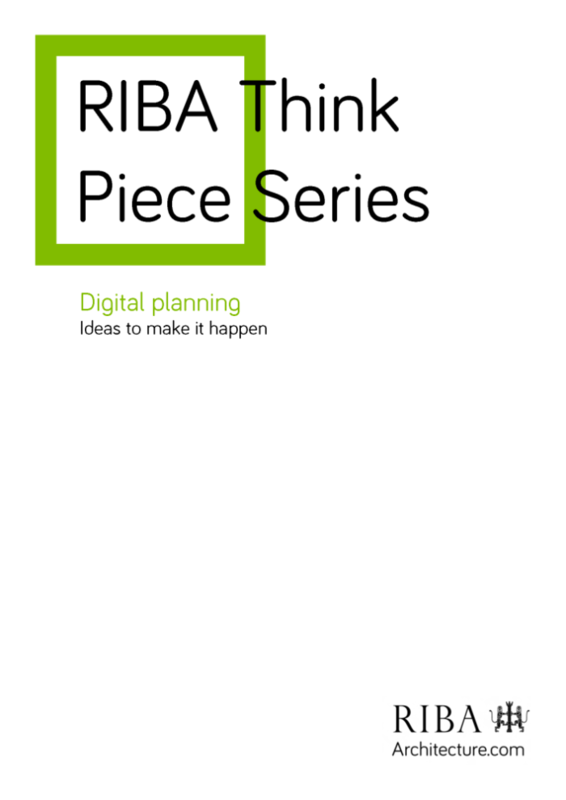 This year RIBA is working towards realising the idea of a Digitised Planning System. As a first step, we are exploring how to best standardise the digitisation and collection of all information submitted for planning across local authorities, and how this information can best be used by them and others. To this end, we invited key experts and innovators to write a think piece sharing their personal viewpoints of what they think a digitised planning system should look like and do, interrogating different ideas and perspectives from across planning, architecture, technology and sustainability.